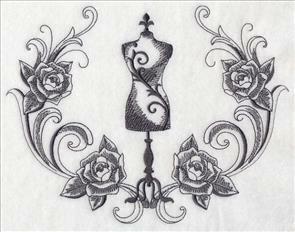 Welcome to the Embroidery Boutique! 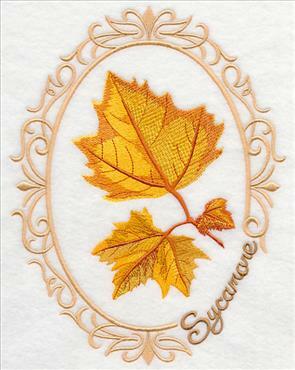 A delightful variety of new designs are ready to add style and sophistication to your garments and home decor projects. 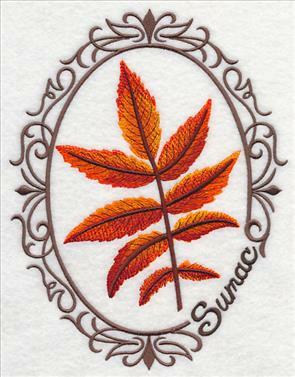 Summer is coming to an end, and autumn's splendor is ready to be stitched onto towels, pillows, pullovers, and blankets. Leaves in elegant filigree frames add a natural touch to home decor. 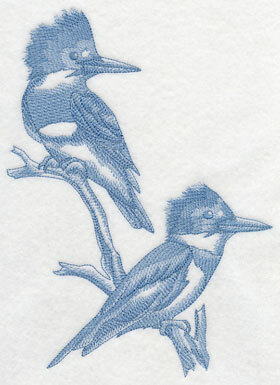 Vintage-stitch birds with antique sewing machines and notions add charm to tea towels. 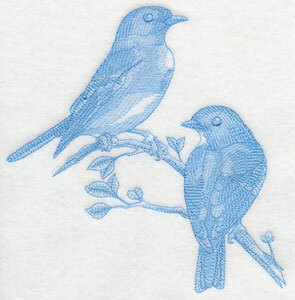 And, toile birds are light-and-lively additions to pillows and tote bags. 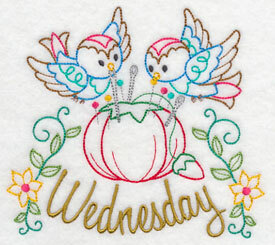 Scroll to see all this week's new designs, and enjoy the Embroidery Boutique! 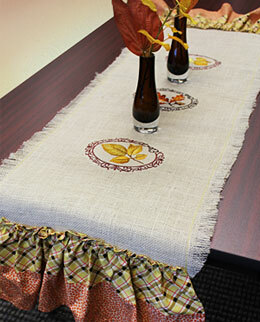 A rustic burlap table runner adds cozy, country charm to home decor. Click here for free project instructions! 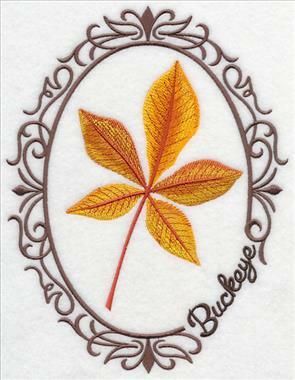 Autumn is in the air, and leaf motifs are popular choices for tote bags, pillow covers, kitchen towels, and aprons. 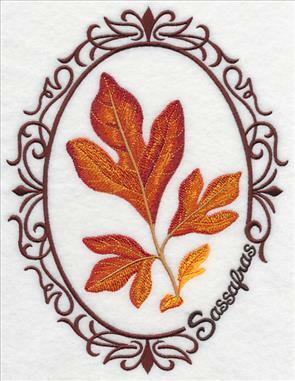 Below you'll find a variety of leaf designs tucked into elegant filigree frames. Look closely and you'll see the tree's name in the filigree too! The colors of autumn are dramatic and glorious, and the designs below are stitched in that color palette. The color change sheets for the leaf cameos include an option for a "summer" version, too! Look for the drop-down box on the color change sheet to make that selection. 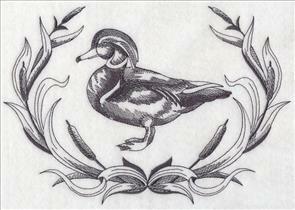 Cameo designs are popular choices for towels, toe bags, table linens, and quilts. If you love these leaf cameos, be sure to see other cameo designs that we've created in the past - like the Kitchen Herb Cameos here. 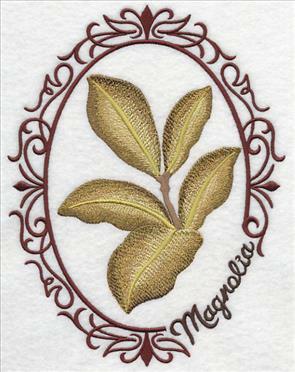 6.90" x 8.93" and 5.86" x 7.58" and 4.86" x 6.29"
Let gorgeous magnolia and maple leaves fall onto your embroidery projects! Add a graceful touch to tote bags and book bags for autumn with these classic cameo designs. 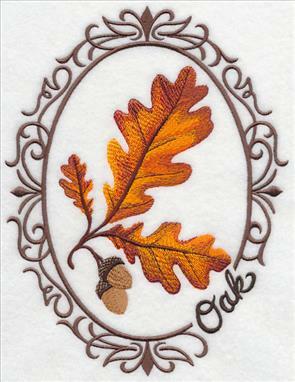 6.86" x 8.87" and 5.86" x 7.58" and 4.85" x 6.26"
Oak leaves and acorns decorate one cameo, while sycamore leaves show off their golden hues in another. Both are excellent for creating distinctive seasonal towel sets for the bath. The shimmering tones of the leaves creates a watercolor effect. 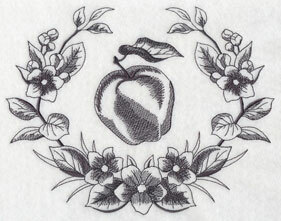 Add artistic appeal to pillow covers, wall hangings, and table toppers for a striking addition to any room. 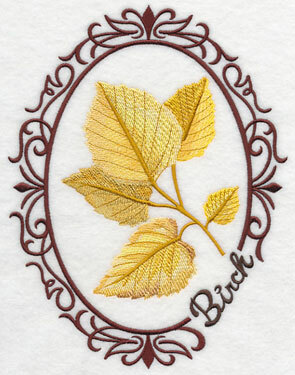 Stitch gorgeous fall foliage this season with incandescent birch leaves and cottonwood leaves. 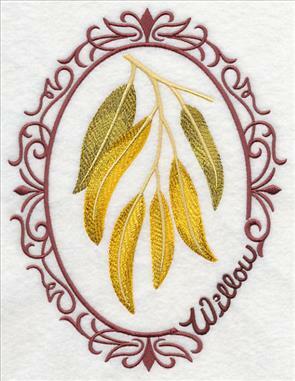 6.90" x 8.93" and 5.86" x 7.58" and 4.84" x 6.26"
Add autumn glow to mini-quilts, towels, tote bags, and more with an elm leaf cameo and a willow leaf cameo. Also gorgeous on pillow shams for an indoor forest scene. 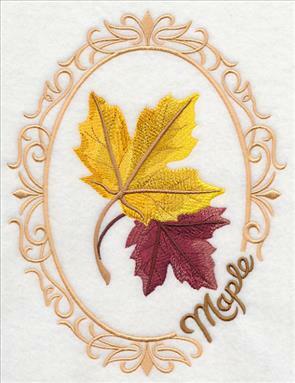 6.86" x 8.88" and 5.86" x 7.58" and 4.84" x 6.26"
Create a fresh look for any season with leaf cameo designs. The autumn and summer color variations are like having two designs in one! 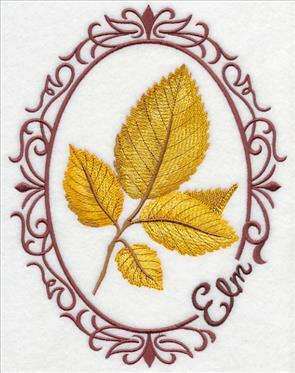 The design pack gives you all the beautiful leaf cameos for sprucing up tote bags, towels, table linens, wall hangings, and more. 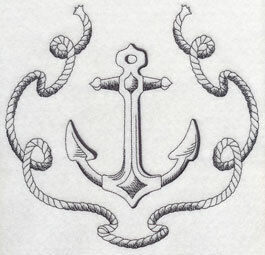 Order the designs individually by clicking the links above, or get the pack with all 12 designs. Three sizes are available to suit any project. 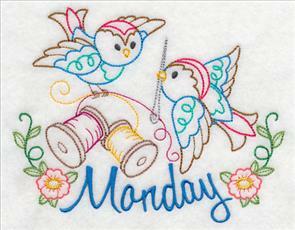 It isn't every day of the week you see such sweet birds in designs this colorful and crafty! 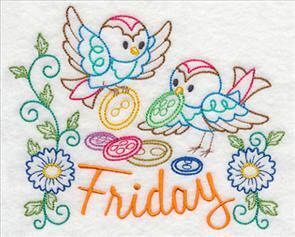 Vintage-stitch is the perfect style to celebrate the stitching arts with days of the week flour sack or tea towels. Whip up a batch for yourself, and for a friend! 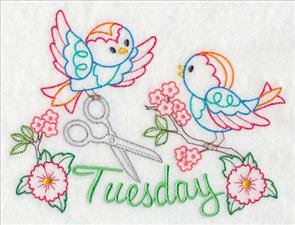 6.19" x 4.86" and 3.86" x 3.03"
Scissors on Tuesday and a pincushion on Wednesday let these birds sew something special. 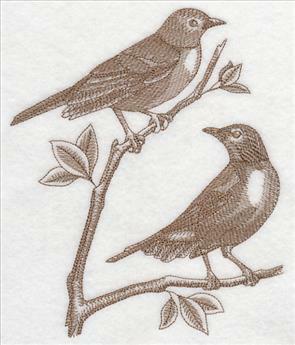 5.51" x 4.86" and 3.86" x 3.40"
A little birdie told me that it's time to freshen towels with fast and fabulous vintage style designs. Craft a sweet new look for the kitchen in a lickety-stitch. 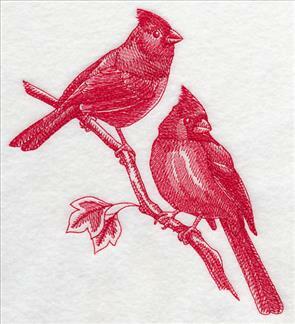 Create a crafty look with these birds -- their stitching adventures are a treat all week long. 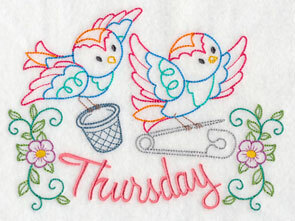 6.52" x 4.85" and 3.86" x 2.88"
Days of the Week Crafty Birds are ready to land on your kitchen towels! 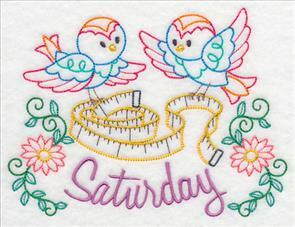 Vintage stitches create a look reminiscent of hand embroidery for colorful and classic style. 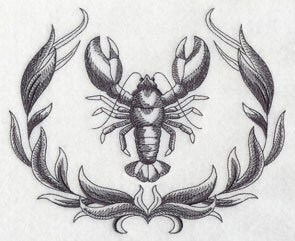 Order the designs individually by clicking the links above, or get the pack with all 7 designs. Two sizes are available to suit any project. 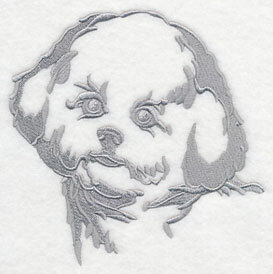 Embroiderers love toile designs for their crisp, clean look and their ease of stitching. With just one color, it's a snap to add a handsome, detailed embellishment to projects in a jiffy. It's also easy to change colors to match decor and fabrics. Below, a pair of cardinals gaze at their surroundings, while a couple of Baltimore orioles are watchful and patient observers. 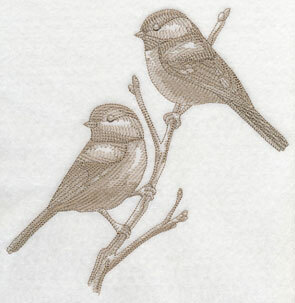 6.90" x 7.26" and 5.87" x 6.18" and 4.85" x 5.11"
Chickadees and bluebirds are perennially popular subjects for the crafty arts, including embroidery. 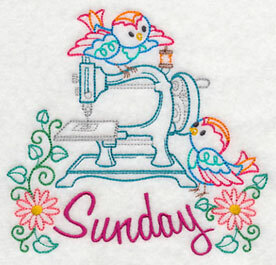 Their friendly and familiar profiles are a treat anywhere you stitch them! 7.72" x 7.80" and 6.90" x 6.97"
6.90" x 7.60" and 5.89" x 6.49" and 4.85" x 5.34"
Fork-tailed flycatchers and kingfishers perch on branches in designs perfect for adding a little excitement to low-nap towels, tote bags, wall hangings, mini-quilts, table toppers, and more. 6.89" x 9.86" and 5.88" x 8.42"
6.89" x 9.31" and 5.75" x 7.79" and 4.85" x 6.54"
Birds of a feather flock together! 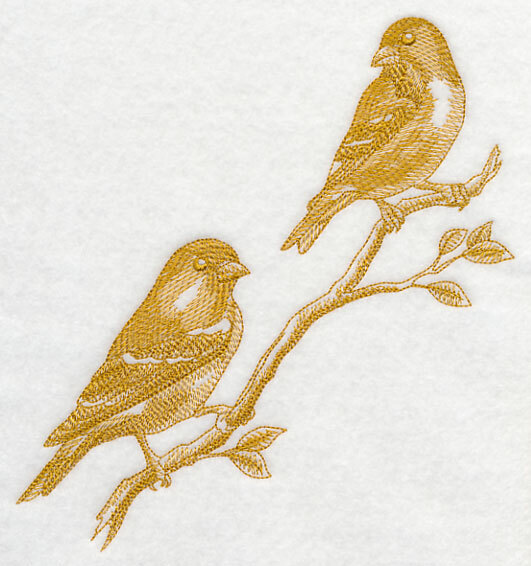 Add pretty perching pairs of robins and goldfinches to quilts and wall hangings for an elegant addition to home decor. Very nice on shirts and towels, too! 6.57" x 7.78" and 5.88" x 6.97" and 4.85" x 5.75"
Even in one color, the distinctive crest and rakish black mask of the cedar waxwing impresses. 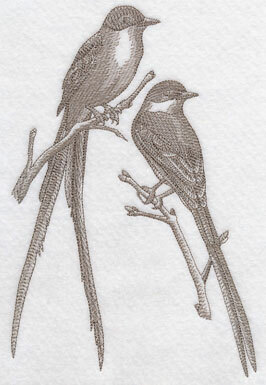 These birds gather by the hundreds in autumn to eat berries. Let them gather on kitchen towels, pillow shams, and quilts for a naturally beautiful look. 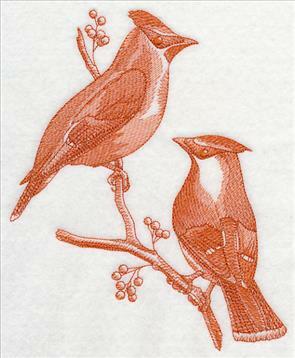 6.88" x 8.42" and 6.36" x 7.78"
5.88" x 7.19" and 4.85" x 5.93"
Create a collection of birds unlike any other with fast and fresh toile designs! Shading and highlights make these designs dimensional and realistic in just one color. 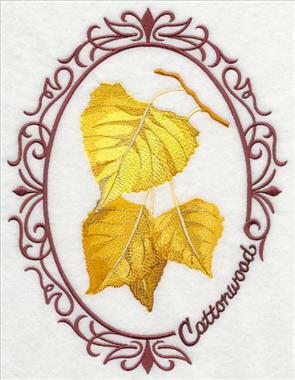 Stitch onto towels, tote bags, wall hangings, pillow covers, quilts, and more for a timeless yet contemporary look. Order the designs individually by clicking the links above, or get the pack with all 9 designs. Four sizes are available to suit any project. 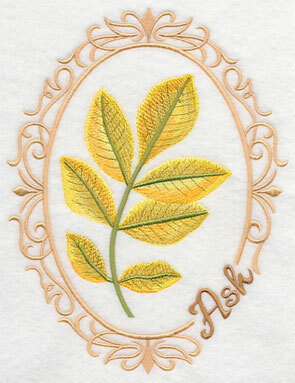 Graceful wreaths of blossoms, leaves, and wheat showcase animals, fruit, vegetables, ocean motifs, and more. Light-stitching designs in one color add a striking look to a wide variety of projects, including low-nap towels, market bags, aprons, shirts, quilts, and jacket backs. 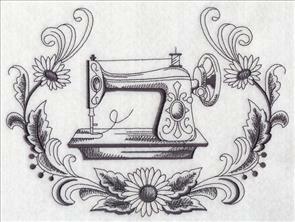 Delicate flowers wreath crafty motifs, highlighting a dress form and antique sewing machine. 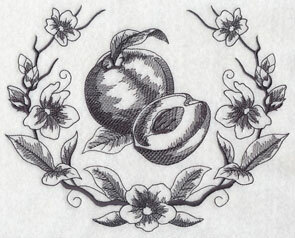 Add old world flavor to contemporary stitching with these classic designs. 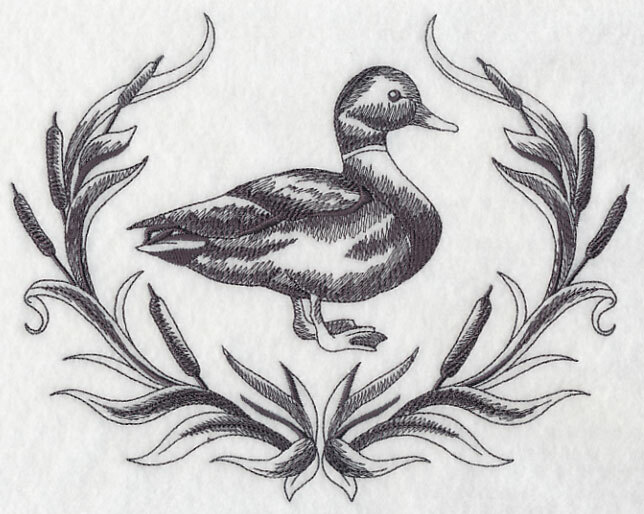 The mallard duck (left) is perhaps the most familiar of ducks, occurring throughout North America and Eurasia. The wood duck (right) is one of the most splendid of all waterfowl, with the males' iridescent chestnut and green, and ornate patterns on nearly every feather. Both bring wild beauty to tote bags, lightweight towels, table toppers, and more. 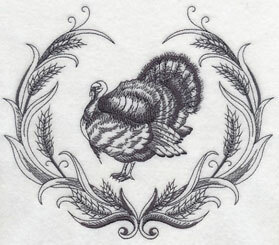 Create a distinctive decoration for Thanksgiving with a turkey and wheat wreath on towels and table linens. 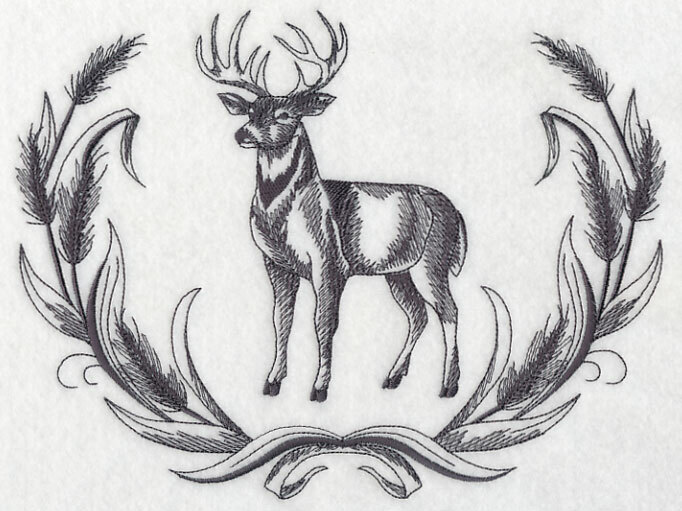 And, a white-tailed buck is handsome on jacket backs, bags, and pillow covers. 9.09" x 6.90" and 7.71" x 5.85" and 6.42" x 4.85"
An anchor brings to mind the salty sea while a bread wreath is comforting and savory. Both will dress up projects with distinctive fashion, for the living room, dining room, and kitchen. 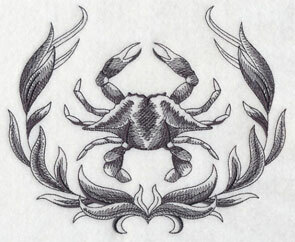 A lobster and a crab bring the bounty of the sea to your stitching. 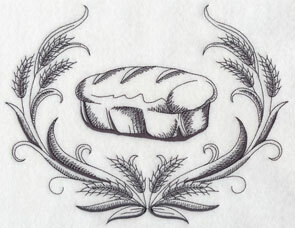 Very fresh on linen napkins! 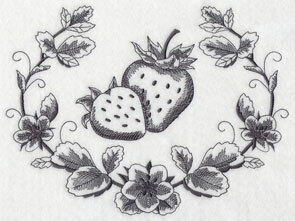 Blossoms encircle strawberries and apples in sweet designs for flour sack and tea towels. Change the thread color to match your project, and embellish any item to suit your taste. 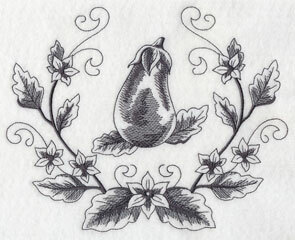 Embroider your way to good health with a wholesome peach wreath and a vitamin-packed eggplant design. 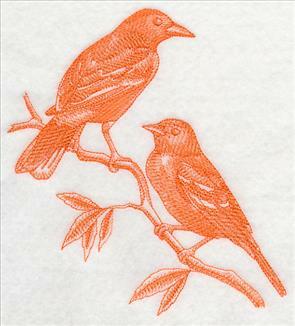 Both are fast to stitch and bring lasting appeal to towels, trivets, and aprons. Each week this space is reserved for one customer's design suggestion. 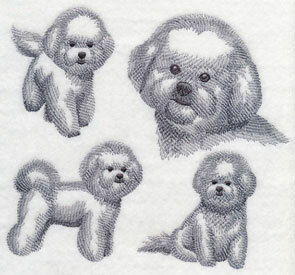 This week's request for a sketch and silhouette of the Bichon Frise comes from Gail. Sometimes compared to a cotton ball because of its curled double coat, this sweet breed has charm to spare. The Bichon first appeared in the 13th century as a descendent from the Water Spaniel, and eventually became a favorite of 16th century French royal courts. Stitch a bit of canine royalty onto tote bags, towels, wall hangings, and more! And thank you for this noble idea, Gail! 5.88" x 5.86" and 4.88" x 4.86" and 3.86" x 3.84"